Scrap This, Save That: Growing In Unity Day 3 - Happy Birthday! Growing In Unity Day 3 - Happy Birthday! Welcome to day 3 of my growing in unity week! Today's original project started out as an epic FAIL!! I had a completely different treat in store for you complete with a process video, but 30 seconds into filming, the battery in my camera died! I replaced it with my fully charged backup...it must have sat too long because it was dead too! No video!! I'll try to have it ready for tomorrow/! So today's card was put together in a hurry! I hope you like it! I used another print and cut file from the Silhouette store, this time in a birthday theme. My daughter's birthday is in a couple of weeks (and then her wedding is the following week!!) so I had cake on my brain! The real "gem" in this card is the chevron background! I love it! It's a part of the Unity stamp set called About the Inches. It's a great set to document a weight loss journey, but as an added bonus, there's this AWESOME chevron background stamp!! I used three different shades of blue chalking ink to ink up the stamp. I dabbed them on randomly but in keeping with a bit of an ombre effect. Love it!! 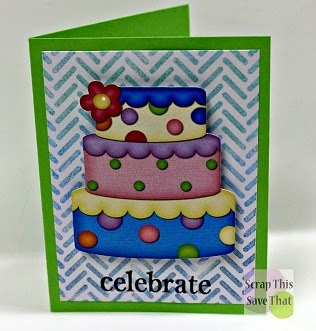 I also used part of the Celebrate stamp set again, for my sentiment. Viola...the card came together quick and easy! Don't forget to leave a comment on any of the Growing in Unity posts this week for a chance to win TWO Itty Bitty stamps from Unity! Also, while you're here, I would love to invite you to become a follower or email subscriber, and to follow on Facebook,Pinterest, Twitter and YouTube. Find your favorites and click to like! Love the cute little guy in the bathroom and the card that looks so much like him! I needed a 4th of Julr card idea! Thanks! 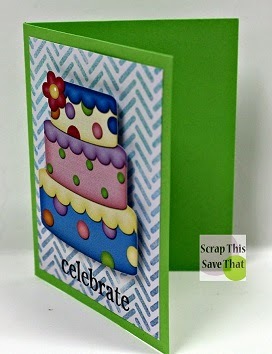 Festive cake card! I love the background too and need to check out that set! Love the bold colors and CAS design, Amy! Adorable! It came together so nicely. I should have made a birthday card for my guy today, but made cake instead! Very nice card Amy, I love the dots on the cake. The background gives it pop. Great card! Congrats on being the GIU girl this week! Love your fun and colorful cake! What a happy card! Great background to this fun cake! Love your card! So colorful & fun! What a fun birthday card! Cute cake! Your background turned out fabulous! I like how colorful the cake is!!! And how it jumps off the page. Good job. Blog Tour 2014 And A Winner!! Growing In Unity Day 2 - Celebrate! Growing In Unity - Day 1 AGAIN! HUGE 1 Day Sale happening NOW! How To Dry Emboss Without An Embossing Folder!